Check out this brilliant video from Sport Ireland showcasing all our hard work for the #BeActive Education Award. The #BeActive Education Award is a European wide award that puts the spotlight on an educational setting that can demonstrate concrete ways in which it encouraged its young people to be active. The #BeActive Awards form part of the European Week of Sport and Sport Ireland, as National Coordinating Body for the week in Ireland, were delighted to nominate our school for the award. As the Easter holidays are drawing near we had an Easter themed WOW day! Children walked to school in their lovely Bunny Ears, Easter Bonnets and Masks! A great start to the school day. Thank you to all who participated! Our Active School Film: Fame for all in St. Clare’s N.S. After a hectic day of filming on 14th December 2016, the final footage of our Active School in action has been uploaded to the National Active School website to guide and inspire other schools who wish to take on the challenge of becoming an Active School. It was a great privilege to be invited to make such a contribution to this Department of Education initiative and we are delighted with the final product. Sincere thanks to all who were involved. It makes us incredibly proud of every single member of our school community-well done one and all! We would invite you to view this video footage by clicking on the link below-it is well worth a look. What a festive, jovial atmosphere there was on our first ever Santa Dash which took place on Tuesday 21st December 2016. Despite bitterly cold conditions, we braved the Arctic air and set out well wrapped up in our Christmas jumpers, winter woollies and Santa hats for a brisk dash around the Nun’s Walking Route. Everyone was in great spirits, singing Christmas carols in full voice as Mr. McCartin kept our school bell jingling all along the way to really give our dash a cheery Christmas vibe. It was such a lovely sight to see almost 450 Santa-hat bearing pupils, teachers and the many, many parents who joined in, snaking along the route, not once but twice! We returned to school invigorated, cheerful and even more buoyed up for the fast-approaching Christmas festivities having done something really positive for charity in the process. To all who took part and donated to the worthy cause of Cancer Care and the Hospice, a huge thank you. It was a wonderfully charitable and enjoyable active event to end 2016! Have a look at us in action on our Santa Dash below. We may have raised our Active School Flag on 2nd December 2016, but our active events are to remain a permanent fixture on the busy calendar of St. Clare’s N.S. and Wednesday morning, 7th December 2016 saw us out in force once again for another WOW day. It was great to see enthusiasm aplenty among all who had gathered on the exceptionally mild morning and we had great numbers join us on the day, all eager, highly visible, energetic and ready to fit in some exercise and friendly chatter before the bell tolled on another school day. Thanks to everyone who came along. We hope to see even greater numbers join us in the new year on our next WOW Day which takes place on 1st February 2017-St. Brigid’s Day. Mark it on your calendar now! Friday, 2nd December 2016 was certainly a day to remember for everyone here in St. Clare’s N.S. as we celebrated not one but two amazing active accolades achieved in recent months. Renowned national dignitaries from political, sporting media and educational arenas along with many distinguished invited guests from the locality descended upon our school on the day to duly recognise and supportively share in the combined celebration of two remarkable accomplishments-the raising of our Active School Flag and the European Be Active Education Award 2016 presented to us by the European Commission. The truly special event marked the culmination of an exhilarating, exciting and eventful year in the life of our school which has now been recognised at local, national and European level for our improvements in provision for physical activity. Both honours however were as a result of the combined efforts of our pupils, staff, parents and wider community and we certainly felt that for everyone involved, a celebration was well-deserved! It was a day that undoubtedly marked the highlight of the year thus far and one that the pupils will recall for many years to come, in particular the first guest that made a surprise appearance early that morning in the arms of Mr. Damien O’Reilly from RTÉ-it was none other than the much sought-after Sam Maguire Cup. With 40% of our pupils hailing originally from Dublin, all of whom have remained staunch Dublin supporters despite their relocation, these pupils, along with all of their Cavan and international counterparts, relished this opportunity to raise Sam Maguire aloft and take some cherished photos alongside this national treasure. There was much more to come on the day however and alongside local distinguished guests, we were honoured to welcome Ms. Mairead McGuinness, M.E.P. and Vice-President of the European Parliament; Mr. Aogán Ó Fearghail, Uachtarán Chumann Lúthchleas Gael; Ms. Marcella Corcoran-Kennedy, Minister of State for Health Promotion; Ms. Karen Cotter, National Co-ordinator of the Active School Flag Programme; and, Bishop Leo O’Reilly all of whom, despite onerous schedules, kindly gave of their time to attend and join in our celebrations. Presenter of Countrywide on RTÉ Radio 1 and with familial links to the locality, Mr. Damien O’Reilly initiated proceedings with a warm, rousing, congratulatory introduction that set the tone for the day ahead and even stoked up that long-standing rivalry between our local Castlerahan G.A.A. Club and its nemesis, Ramor United! After this introduction, our school choir, led by Mr. Shane McHugh, epitomised our fighting spirit in song with a feisty rendition of ‘The Eye of the Tiger’ that provided a lively start to the entertainment presented on the day. Mr. Karl McCartin, then addressed the gathering, praising our wonderful staff and pupils for their enormous efforts along with proffering sincere appreciation to our ever-supportive parental body for so willingly assisting and becoming involved with the active school initiative at every opportunity. It was a day however for the spotlight to shine on the hardworking members of the St. Clare’s Active School Committee. Introduced by Ms. Verena Cunningham, each in turn described to all in attendance the assortment of active measures that had been implemented and brought us to the celebration of this very special day. With contributions from all serving committee members, including pupils, Ms. Anne Sullivan and Ms. Niamh Coleman, when their presentation concluded and they took their bow, all present were left fatigued at the mere description of the activities that had been undertaken during the year. One example of such activities was exhibited by a group of 6th class pupils who provided an intricate skipping presentation before Ms. Marcella Corcoran-Kennedy, Minister of State for Health Promotion spoke fittingly to the children, congratulating them on what they had achieved and acknowledging the powerfully positive impact of our active school programme on their health both now and in the future. She encouraged us all to continue in this vein, lauded our school as an example for others to follow and light-heartedly remarked that the introduction of Free-Dance Fridays in Leinster House could be a very good idea! A performance of the New Zealand Haka as Gaeilge by the 5th class pupils followed and once again portrayed that spirit of determination and passion that embodies our culture here in St. Clare’s N.S. Mr. Aogán Ó Fearghail, President of the G.A.A. took to the rostrum afterwards and enlightened our pupils as to the meaning and purpose of the Haka, declaring Ballyjamesduff as their very own Haka to defend and take pride in. His words of congratulations were warmly received and while recognising the incredible input of the pupils, he specifically extolled the teachers of Ireland as among the finest worldwide and praised our staff for their dedication and selfless commitment to the Active School project. Before concluding, Mr. Ó Fearghail led the children in an impromptu performance of that famous local song ‘Come Back Paddy Reilly to Ballyjamesduff’, leaving all who had gathered intensely proud of our very own Haka. An angelic performance of ‘This Little Light of Mine’ by 1st class pupils then captivated one and all before Ms. Mairead McGuinness arose and unexpectedly provided the most rejuvenating performance during proceedings. Amidst her kind words of praise and admiration, she epitomised the active theme of the event, leading us in a lively performance of the ‘Hokey Cokey’ and highlighting the significant multicultural dimension of our pupil population that has created a diverse but strong and unified school community. Continuing with the active nature of the day, Ms. Mc Kay’s 3rd class pupils presented a contemporary dance routine that skilfully combined fundamental movement skills with an element of literacy that was thoroughly enjoyed by the crowd before our achievements were publicly commended by both Bishop Leo O’Reilly and Fr. Andrew Tully, Chairperson of our Board of Management. Drawing the day to a close was a perfectly choreographed martial arts performance by some 6th class aficionados that enthralled those in attendance; a complimentary contribution from Ms. Karen Cotter, National Co-ordinator of the Active School Flag initiative; and, a respectful finale when the gathering stood to attention and, led by Mrs. Dolan-Brady and the school choir, together sang Amhrán na bhFiann. With formal proceedings concluded, the twelfth-month programme of improvement to provision for physical activity reached its climax, when all 448 pupils, staff members and invited guests streamed outdoors, and an excited countdown preceded the rousing raising of our well-deserved and hard-earned Active School Flag. Cheers and applause filled the air as the flag flew upwards before the crowd returned indoors to enjoy the delicious refreshments organised by our dedicated Parents’ Association. It was a uniquely memorable day of celebration for all involved and with our European Be Active Education Award and our Active School Flag now flying proudly atop our central flagpole, our active motto is certainly no longer an aspiration but the reality. What a wonderful day it was, a day to be proud of every single member of the community of St. Clare’s N.S. and may our much-improved active ethos continue to develop and thrive for evermore! What spooky, gruesome fun we had on the final day before our mid-term break! Everyone donned, and many designed, their scariest costumes for a day of Halloween fun, games, tricks and treats. The costumes were chillingly creative, the face-paint fantastically frightening and the effort made by one and all was splendid to see. The day ended with a Junior Halloween Disco in the G.P. Room from 1-2pm, while our senior students assembled to strut their macabre moves from 2-3pm. Even the teachers joined in! It was a great and active end to what has been a busy half-term in St. Clare’s N.S. Being active is so important to our future health. We in St. Clare’s N.S. want to lay those active foundations at infant level so we extended an invitation to our 6th class pupils to help us to do so by becoming Playground Leaders. There was great interest from both sixth classes and eight Playground Leaders for this term were chosen, four from Mr. Smith’s class and four from Ms. O’Connell’s class. After meeting with Ms. Cunningham and Ms. McGuire, our Playground Leaders started their important work in the junior and senior infant yard on Wednesday 19th October 2016. They now visit the infant yard every Wednesday at lunchtime and help our youngest pupils to use the playground markings and introduce them to a few new playground games every month, starting with ‘Duck Duck Goose’ and ‘Shopkeeper Shopkeeper’ for the month of October. The children are enjoying every minute of it! Thanks to Ms. McGuire and our 6th class pupils who have been so helpful, generous and responsible in giving up their own free time to take on this project. A new initiative for this year is ‘Friday Fitness Fun’ which began on 7th October 2016. Each Friday at lunchtime, one class has the opportunity to use a variety of equipment in the P.E. Hall, instead of going outdoors to the playground. So far, this has been a great success. Our 6th and 5th class pupils have already enjoyed their indoor play sessions and it is a real treat to be able to use our P.E. equipment at lunchtime. Thanks to our three reliable helpers from 6th class who set out the equipment every week and to Ms. Coleman for all her help with our latest active idea which allows us to engage in the full range of fundamental movement skills (running, jumping, skipping, throwing and catching) in a way that we cannot in our limited playground space. All other classes are really looking forward to their turn to experience an active lunchtime with a difference! Bright and early on Wednesday morning, 5th October 2016, WOW Days resumed for this school year. And what a start it was! With a slight change from last year, we reduced our meeting points from four to three, with walking groups taking off from the Cavan/Crosskeys Rd (Cusack Estate), Virginia Rd. (Green area before Skellys) and Market House in the centre of town. A beautiful dry October morning, the turnout was fantastic. Pupils, parents, grandparents, friends, neighbours and staff members all congregated in their high-visibility vests for an energetic and social start to the school day. For the first time also we were joined by our special guest-Louie the Lion, our official school mascot, designed by 3rd class pupil Zuzanna Drwalewska-who also donned his high-visibility vest for the occasion. The atmosphere was wonderful, the energy palpable, and the unity that lies at the heart of our entire school community truly evident. Well done to all who participated and to anyone who opted for the car that morning, there will be plenty more opportunities to take part in a WOW Day as for this year, WOW will take place on the first Wednesday of every month (except when school is closed). For the list of WOW dates to mark in your diary and for a snapshot of the fun that was had last Wednesday morning, see below. A new venture for our school this year is martial arts. To introduce our pupil to a brand new physical activity that had never featured in our extra-curricular programme, we were delighted to gain the expertise of local man Mr. Larry McQuaid from Black Dragons Martial Arts club. From the 26th September our pupils from 3rd and 6th class have been developing and refining their martial arts skills. We will be very sorry when this five-week programme comes to an end. It has been a great opportunity and experience for all concerned. As we continue our efforts to introduce our pupils to a wide range of sports in St. Clare’s, we were delighted to welcome Michael our tennis coach back in September. Our 4th and 5th class pupils are currently enjoying his lessons and tennis skills are improving week by week. A future Wimbledon competitor-who knows???? As European Week of Sport came to an end, fantastic news was to follow. Having been selected by Sports Ireland as one of the Irish entries for the European Commission Be Active Education Award 2016, as the summer holidays came to a close we learned that we had progressed from being Irish finalists to European finalists. It was an amazing achievement to be shortlisted among the top three on such a vast continental scale. Mr. McCartin and Ms. Cunningham represented our school at the European Week of Sport Flagship Event in Brussels on the 15th September where even better was to come! Our great efforts to improve our activity levels paid off and for embarking upon a novel programme of creative, inexpensive, replicable, inclusive, effective and fun physical activity, St. Clare’s N.S. Ballyjamesduff were announced as overall winners and awarded the Be Active Education Award 2016-what a truly remarkable achievement and recognition for our little corner of Cavan, Ireland. Even the Minister for Education has been in touch to recognise our achievement-what an honour! 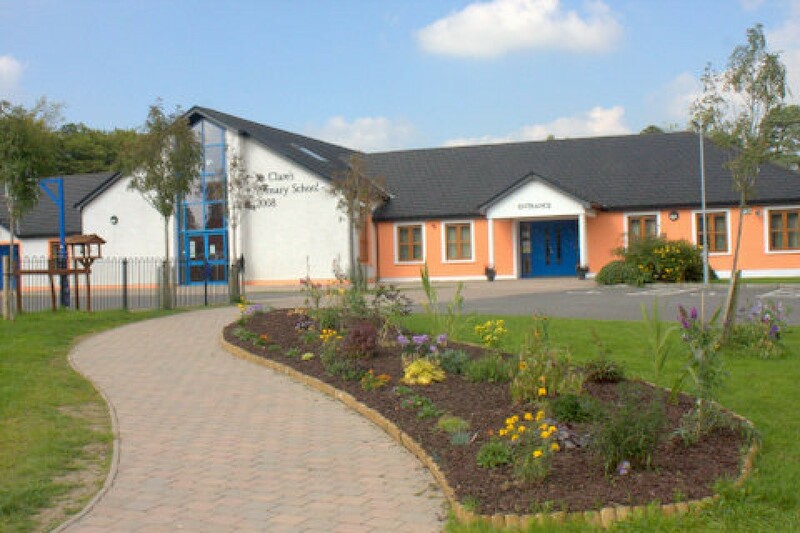 To all who have worked together in making our Active School Programme such a success we say thank you-our wonderful pupils; our enthusiastic tireless staff members; our helpful, supportive co-operative parents and families; our local sports clubs and organisations; and our entire community of Ballyjamesduff, this landmark achievement has been earned by one and all-Congratulations everyone! What a start to our Active School Progress for this school year! Once Darragh and Nathan, our two new committee members from 2nd class had been appointed and welcomed on board, our Active School Committee met and planned our first active event of the new school year -a fantastic week of sporting activities to coincide with European Week of Sport 2016. From 10th-18th September 2016 European Week of Sport, which aims to promote sport and physical activity across Europe was celebrated. Irish schools were asked to take part and here in St. Clare’s N.S. we accepted this challenge as a great way to kick-start the new school year. We organised an eventful week of fun, inclusive and energetic physical activities in which all of our pupils participated, a week that was thoroughly enjoyed by all-pupils and staff members alike! As our very first Active Week, we were thrilled with what was a successful start to our Active School Programme for 2016/2017 and a fun-filled celebration of European Week of Sport 2016 here in Ballyjamesduff. Our first event of the week was Move it Monday where we all simultaneously responded to the intercom countdown to ‘Drop Everything and Move’ from 12-12.10pm. Some danced, others jogged, many exercised, a few used GoNoodle, but everyone moved nonstop until time was up and we were all tired out! Try it Tuesday involved introducing all children to a new way of being active and we were delighted to welcome Mr. Brian Coleman, a personal trainer from BC Fitness, Ballyjamesduff to our school not just on Tuesday, but on every afternoon during the week to conduct a fitness session with each class. What incredible workouts we all got to experience and despite a few aching muscles afterwards, these fitness sessions were thoroughly enjoyed! Sincere thanks to Brian for his energy, enthusiasm, encouragement and most importantly for freely giving up his own time to work with us in St. Clare’s each afternoon for the entire week-it was truly appreciated! BC Fitness-thanks for making fitness fun!! 14th September 2016: Who will Win Wednesday? Competition was rife and tension was in the air at midday on Wednesday as ten brave staff members lined out against our ten-strong pupil team for a tightly matched game of Dodgeball. One pupil represented each of our ten classes from 2nd to 6th, all of whom congregated in the school hall to support their class player. Mr Smith set out the rules, our neutral referee Ms. Coleman got the game underway and what fun we had. The balls were lobbed, the cheering deafened and the excitement escalated as the first match was claimed by the staff squad and the second by the pupil panel. The final match, the decider was a nail-biting conclusion to our first-ever pupil-teacher challenge. Who emerged triumphant? The teachers!!!!! For Teamwork Thursday everyone worked together to complete ‘Climb the Heights’ Skipping Challenge to see how many of Europe’s mountains that our school could climb. Each class skipped for fifteen minutes, counted their total number of skips and selected the European mountain they had climbed on a poster in the hall as each skip equalled an ascent of 1m. How fit we are and what a brilliant team we have in St. Clare’s as we managed not alone to climb every single mountain in Europe but far exceeded the total number of skips (which was 60,151) required to do so. With a total of just over 98,000 skips between all of our 450 pupils, we also reached the summit of the four highest mountains in the world: Mount Everest, K2, Kangchenjunga and Lhotse! Well done everyone-we make one superb team. Together Everyone Achieves More-and that we did! As European Week of Sport 2016 came to an end, we realised that we had certainly made our Active School motto a reality throughout this week-Healthy Children and Active Kids Makes St. Clare’s the Place it is- St. Clare’s N.S., Ballyjamesduff was a fantastic place to be during European Week of Sport 2016 and it really was a wonderful way to launch our Active School Programme for the year ahead. Thanks to everyone for participating so willingly and enthusiastically-well done everybody!